The Hispanic Association of Colleges and Universities staff members were in Chicago, Ill., on Nov. 14, 2018, for its first 33rd Annual Conference Host and Advisory Council meeting held at the Hilton Chicago, site of the 2019 conference. 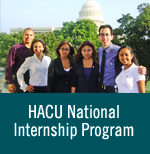 HACU's 33rd Annual Conference, "Championing Hispanic Higher Education Success: Meeting the Challenge of Prosperity and Equality," Oct. 5-7, 2019, will also include a Student Track renamed as the HACU ¡Adelante! Leadership Institute, an International Plenary, Town Hall, Exhibit Hall, a College and Career Fair, as well as two days of workshops discussing emerging trends in higher education affecting Hispanics and HSIs. Pre- and post-conference events will also be offered. For more information on the Conference, click here.